and entertain the crowd with their natural talent. guitars to a captive group of enthusiasts. 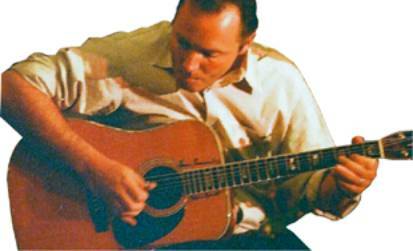 When he was 15, his fascination with the guitar grew and a dilemma arose. “At that time, I realised that playing the guitar was all I was good at. So I had to decide whether I wanted to focus on school or put my energy into music. The problem was that I realised that it was difficult to make a good profession out of music,” he said. But with unwavering passion and sheer determination, Voorst pursued his dream and never looked back. After 1996, he had the honour of meeting Jan Akkerman, a renowned and award-winning Dutch musician. He passed one of his CDs to Akkerman and asked if he would be so kind to listen to it so that he could advise how to improve his guitaring. A week later, Akkerman called back and asked ‘Why don’t we make an album together?’ “It was like a dream come true,” Voorst said. Having produced an album with an established and well-respected musician such as Akkerman had opened the doors for Voorst. “In Holland, there is this perception that if you record an album with someone famous, you must be very good,” he said. “I feel I have been blessed with luck in the industry so far.” Although Voorst attributed the successful beginning of his career to his meeting with Akkerman, his talent is undeniably the main reason he leaves a mark in the music industry today. He cited guitar-greats such as Chet Atkins, Tommy Emmanuel, Larry Colton and Creedence Clearwater Revival as some of his influence and favourites. 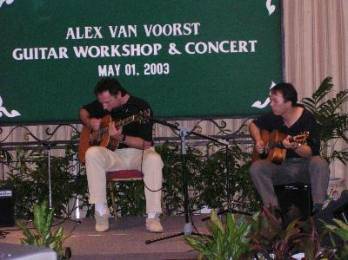 Voorst recently performed five concerts in Malaysia with Sabah being his last stop before heading back to Holland where he will record his next album. Voorst plays one of his original pieces for the audience. He added that playing in Malaysia has been a wonderful experience than many other places he has been to. “For one, the crowd is more enthusiastic than the Europeans and I find that great. In fact, when I played in Auditorium DBKL recently, I played an extra half hour because the crowd just kept cheering me on” he said. “When I play, I try to make a connection with the crowd. I try to say something and inspire them and always aim to give my best in every performance,” he added. Voorst’s advice to budding musicians? Play with your heart. “If you play without dedication and emotion, the music loses its strength. You must believe in you own music and it doesn’t matter if other people don’t like it,” he said. 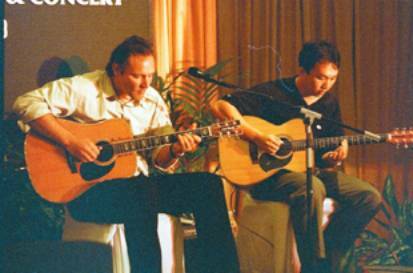 Those who attended the concert were given a special treat when Roger Wang, Sabah’s own guitar maestro, joined Voorst on stage. The duo entertained the crowd with classic favourites and original pieces as well as an impromptu ‘jamming’ session, which proved that the pair were true-blue musicians. Earlier in the day, Voorst conducted a guitar workshop along with Jeffrey Yong of the Guitar Institute of Malaysia (GIM) at the same venue. 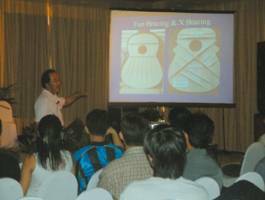 Yong, a guitar player for more than 10 years, presented a talk on modern and traditional guitar making to some 50 guitar enthusiasts. The concert and workshop was jointly organised by the Royal Embassy of Netherlands, National Arts Academy, GIM Music & Instruments Corporation and RAM Production Sdn. Bhd.